Infusions of Grandeur: Bacon vs. Fake Bacon: Grudge Match! Bacon vs. Fake Bacon: Grudge Match! The very first comment we received on our first post at Infusions of Grandeur was a request. That request has become both a running joke and a Holy Grail in the laboratory, something we've always wanted to do but never dared. The request was for vodka infused with the flavor of bacon. Not long after we launched the site, a bacon vodka was in fact attempted by one of our mentors, the Vodka God. Unfortunately, his bacon infusion was roundly regarded as a failure, retaining an unpleasant fatty residue even after filtration. After the Vodka God's bust, bacon vodka was set the more firmly in our minds as a bad idea, though we occasionally considered trying it with artificial "bacon pieces" such as Bac-O's. (The Vodka God used pre-crumbled, reduced-fat bacon bits, but they were made of genuine bacon.) Last week, however, my esteemed colleague discovered a January post on the blog Brownie Points, which described another methodology for infusing vodka with real bacon and removing the fat afterwards. We decided to peer-review the Brownie Points method, and to simultaneously create a fake "bacon" bits infusion for side-by-side comparison. Brownie Points' author McAuliflower developed her bacon vodka by infusing vodka with cooked strips of bacon, unrefrigerated for three weeks. She then placed the infused vodka in the freezer, allowing the fats to solidify, then strained out the frozen fats using a coffee filter. (The Vodka God also kept his vodka in the freezer for serving purposes, but his vodka was only filtered pre-freezing, if we are not mistaken.) Of course, due to the chemical properties of ethyl alcohol, the vodka itself will not actually reach the freezing point in most household freezers. 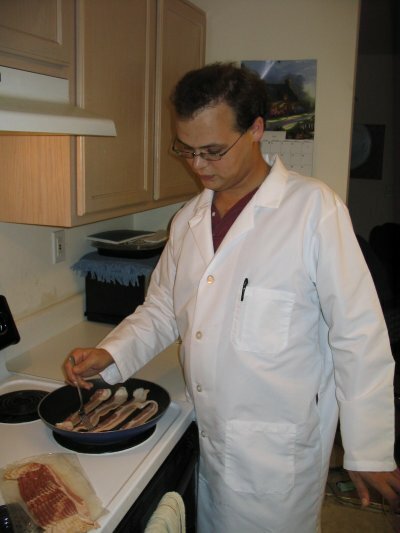 Wayland began the experiment by frying some bacon in a science pan. We used three strips of bacon for the infusion; a fourth was reserved for immediate consumption. The bacon was cooked until crisp, and laid on paper towels to drain off as much grease as possible. 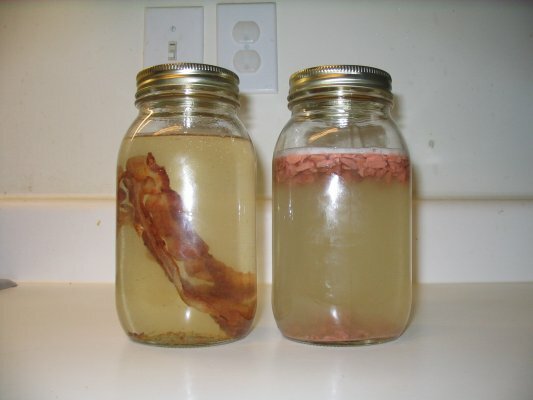 We then sealed the bacon in a science jar with 750 mL of vodka, and placed it in a dark cupboard. For the second test batch, we used 1/2 of a cup of McCormick Bac'n Pieces. 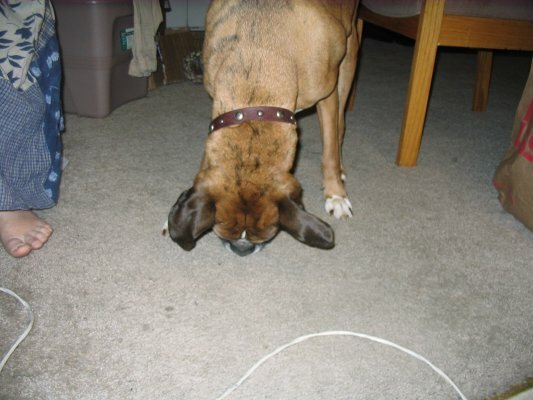 As we discovered, dogs really don't know it's not bacon. The bacon bits contain no cholesterol, but they do have 1.5 grams of fat per 7 gram serving. This means that they are roughly 21% fat, so our attempt to eliminate fatty residue may well backfire on us. For the record, the ingredients listed on the bacon bits' label are as follows: textured soy flour, partially hydrogenated soybean oil, salt, corn starch, natural and artificial flavors, caramel color, hydrolyzed soy protein, corn gluten, wheat protein, FD&C red 3, and autolyzed yeast. We combined half a cup of bacon bits with 750 mL of vodka and shelved it. For control purposes, we will subject this batch to the same freezing process as the other one. We'll see how this turns out in three weeks! I'm really excited to see how this one turns out. If it does well, I can see this being my first at-home experiment for infusing vodka. Wow. That made me gag a little. My money's on real bacon. The other stuff comes dangerously close to tofu in my book. Tofu vodka? For the vegans out there? Have you guys tried almond vodka? JFargo go look at http://www.holyducttape.com/infusions/experiments.htm Almond is the first experiment. Ah, there we go. That list is exactly what I needed, or something similar. Thank you! I developed a breakfast bacon shooter you might like: 1/2 oz Bols Egg Liqueur, 1/2 oz Kahlua (or coffee liqueur), dash of Squeez Bacon (http://www.thinkgeek.com/stuff/41/squeez-bacon.html). I call it "The Breakfast Special". It can/should/must be followed by a Bloody Mary chaser. When I say bounce, you say, how high?